Scientific IOCCG working groups investigate various aspects of ocean-colour technology and its applications, and generally publish a comprehensive report at the end of their deliberations. All publications in the IOCCG Report Series have ISSN and ISBN assignments and are in wide demand throughout the world. They have been used to provide appropriate advice to Space Agencies, scientists and managers as well as serving as a useful teaching aid for students. 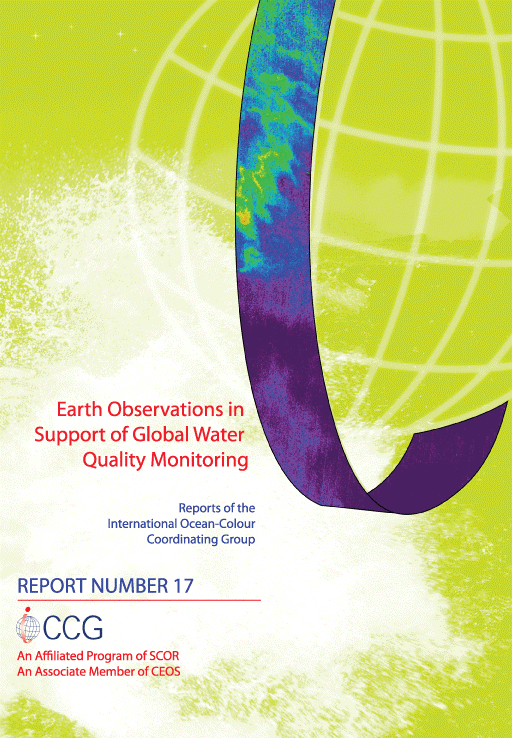 PDF copies of the IOCCG reports (low resolution images to reduce file size) can be downloaded below by clicking on the report cover image. The correct citations for the IOCCG Report series can be downloaded into a reference database using the BibTex file. To request a hard copy of IOCCG Reports #1 to 17, please complete the request form here (maximum of 5 reports each). Ocean Colour Remote Sensing in Polar Seas. Edited by Babin, M., Arrigo, K., Bélanger, S. and Forget, M-H. (pp. 129). Phytoplankton Functional Types from Space. Edited by Shubha Sathyendranath, pp. 156. Download Report 15 in Chinese. In-flight Calibration of Satellite Ocean-Colour Sensors. Edited by Robert Frouin, pp. 106. Mission Requirements for Future Ocean-Colour Sensors. Edited by Charles R. McClain and Gerhard Meister, pp. 106. Ocean-Colour Observations from a Geostationary Orbit. Edited by David Antoine, pp. 102. Bio-Optical Sensors on Argo Floats. Edited by Hervé Claustre, pp. 89. Atmospheric Correction for Remotely-Sensed Ocean-Colour Products. Edited by Menghua Wang, pp. 78. [Synthesized Dataset]. Partition of the Ocean into Ecological Provinces: Role of Ocean-Colour Radiometry. Edited by Mark Dowell and Trevor Platt, pp. 98. Why Ocean Colour? The Societal Benefits of Ocean- Colour Technology. Edited by Trevor Platt, Nicolas Hoepffner, Venetia Stuart and Christopher Brown, pp. 141. Download brochure (English, French, Spanish, Portuguese, Japanese, Korean, Chinese). Accompanying Introduction of Ocean Colour Sciences (Chinese). Ocean-Colour Data Merging. Edited by Watson W. Gregg, pp. 68. Guide to the creation and use of ocean-colour, Level-3, binned data products. Edited by David Antoine, pp. 88. Status and Plans for Satellite Ocean-Colour Missions: Considerations for Complementary Missions. Edited by James A. Yoder, pp. 43. Download Reports 1-3 in Chinese. Minimum Requirements for an Operational Ocean-Colour Sensor for the Open Ocean. Edited by André Morel, pp.46. Download Reports 1-3 in Chinese.